ENDS Compliance Manager (ECM) enables organisations to track and demonstrate compliance with UK and EU environmental and health & safety legislation. 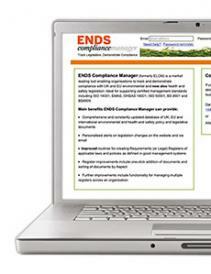 With ENDS Compliance Manager, subscribers can track new law, policy, guidance and official consultations through the daily updated website and with customisable email alerts. The ECM database of 29,000+ legal and policy documents provides an invaluable research tool for exploring current and historic rules and regulations. The ECM legal register creation tool enables subscribers to organise all applicable documents into registers as required by major environmental health & safety (EHS) management systems, including ISO 14001, EMAS, OHSAS 18001, ISO 50001, BS 8901, BS8909 and ISO 9001.